Doyle was a prolific writer; his non-Sherlockian works include fantasy and science fiction stories about Professor Challenger and humorous stories about the Napoleonic soldier Brigadier Gerard, as well as plays, romances, poetry, non-fiction and historical novels. One of Doyle's early short stories, "J. Habakuk Jephson's Statement", helped to popularise the mystery of the Mary Celeste. Doyle is often referred to as Sir Arthur Conan Doyle or simply Conan Doyle (implying that "Conan" is part of a compound surname as opposed to his given middle name). His baptism entry in the register of St Mary's Cathedral, Edinburgh, gives "Arthur Ignatius Conan" as his given names and "Doyle" as his surname. It also names Michael Conan as his godfather. The cataloguers of the British Library and the Library of Congress treat "Doyle" alone as his surname. Steven Doyle, editor of The Baker Street Journal, wrote, "Conan was Arthur's middle name. Shortly after he graduated from high school he began using Conan as a sort of surname. But technically his last name is simply 'Doyle'." When knighted, he was gazetted as Doyle, not under the compound Conan Doyle. Doyle was born on 22 May 1859 at 11 Picardy Place, Edinburgh, Scotland. His father, Charles Altamont Doyle, was born in England, of Irish Catholic descent, and his mother, Mary (née Foley), was Irish Catholic. His parents married in 1855. In 1864 the family dispersed because of Charles's growing alcoholism, and the children were temporarily housed across Edinburgh. In 1867, the family came together again and lived in squalid tenement flats at 3 Sciennes Place. Doyle's father died in 1893, in the Crichton Royal, Dumfries, after many years of psychiatric illness. Supported by wealthy uncles, Doyle was sent to England, at the Jesuit preparatory school Hodder Place, Stonyhurst in Lancashire at the age of nine (1868–70). He then went on to Stonyhurst College until 1875. While Doyle was not unhappy at Stonyhurst, he did not have any fond memories since the school was run on medieval principles, with subjects covering rudiments, rhetoric, Euclidean geometry, algebra, and the classics. Doyle commented later in his life that the academic system could only be excused "on the plea that any exercise, however stupid in itself, forms a sort of mental dumbbell by which one can improve one's mind." He also found it harsh, citing that instead of compassion and warmth, it favoured the threat of corporal punishment and ritual humiliation. From 1875 to 1876, he was educated at the Jesuit school Stella Matutina in Feldkirch, Austria. His family decided that he would spend a year there with the objective of perfecting his German and broadening his academic horizons. He later rejected the Catholic faith and became an agnostic. A source attributed his drift away from religion to the time spent in the less strict Austrian school. He also later became a spiritualist mystic. From 1876 to 1881, Doyle studied medicine at the University of Edinburgh Medical School, including periods working in Aston (then a town in Warwickshire, now part of Birmingham), Sheffield and Ruyton-XI-Towns, Shropshire. During that time, he studied practical botany at the Royal Botanic Garden in Edinburgh. While studying, Doyle began writing short stories. His earliest extant fiction, "The Haunted Grange of Goresthorpe", was unsuccessfully submitted to Blackwood's Magazine. His first published piece, "The Mystery of Sasassa Valley", a story set in South Africa, was printed in Chambers's Edinburgh Journal on 6 September 1879. On 20 September 1879, he published his first academic article, "Gelsemium as a Poison" in the British Medical Journal, a study which The Daily Telegraph regarded as potentially useful in a 21st-century murder investigation. Doyle was the doctor on the Greenland whaler Hope of Peterhead in 1880. On 11 July 1880 John Gray's Hope and David Gray's Eclipse met up with the Eira and Leigh Smith. Photographer W.J.A. Grant took a photograph aboard the Eira of Doyle along with Smith, the Gray brothers, and ships surgeon William Neale. This was the Smith exploration of Franz Josef Land that on 18 August resulted in the naming of Cape Flora, Bell Island, Nightingale Sound, Gratton ("Uncle Joe") Island, and Mabel Island. As M.B., C.M. after his graduation from university in 1881, he was ship's surgeon on the SS Mayumba during a voyage to the West African coast. He completed his Doctor of Medicine degree (an advanced degree in Scotland beyond the usual medical degrees) on the subject of tabes dorsalis in 1885. In 1882, Doyle joined former classmate George Turnavine Budd as his partner at a medical practice in Plymouth, but their relationship proved difficult, and Doyle soon left to set up an independent practice. Arriving in Portsmouth in June 1882, with less than £10 (£1000 today) to his name, he set up a medical practice at 1 Bush Villas in Elm Grove, Southsea. The practice was not successful. While waiting for patients, Doyle returned to writing fiction. In early 1891, Doyle attempted the study of ophthalmology in Vienna. He had previously studied at the Portsmouth Eye Hospital to qualify to perform eye tests and prescribe glasses. Vienna was suggested by his friend Vernon Morris as a place to spend six months and train to be an eye surgeon. Doyle found it too difficult to understand the German medical terms at the classes in Vienna and quickly quit his studies there. For the rest of his two-month stay in Vienna, he pursued other activities, such as ice skating with his wife Louisa and drinking with Brinsley Richards of the London Times. He also wrote The Doings of Raffles Haw. After visiting Venice and Milan, he spent a few days in Paris observing Edmund Landolt, an expert on diseases of the eye. Within three months of his departure for Vienna, Doyle returned to London. He opened a small office and consulting room at 2 Upper Wimpole Street, or 2 Devonshire Place as it was then. A Westminster City Council commemorative plaque is over the front door. He had no patients according to his autobiography and his efforts as an ophthalmologist were a failure. Doyle struggled to find a publisher for his work. His first work featuring Sherlock Holmes and Dr. Watson, A Study in Scarlet, was written in 3 weeks when he was 27 and taken by Ward Lock & Co on 20 November 1886, giving Doyle £25 (£2700 today) for all rights to the story. The piece appeared one year later in the Beeton's Christmas Annual and received good reviews in The Scotsman and the Glasgow Herald. Holmes was partially modelled on his former university teacher Joseph Bell. 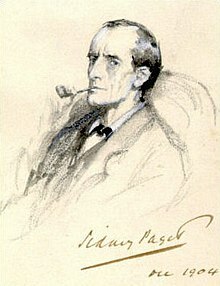 In 1892, in a letter to Bell, Doyle wrote, "It is most certainly to you that I owe Sherlock Holmes ... round the centre of deduction and inference and observation which I have heard you inculcate I have tried to build up a man", and in his 1924 autobiography he remarked, "It is no wonder that after the study of such a character [viz., Bell] I used and amplified his methods when in later life I tried to build up a scientific detective who solved cases on his own merits and not through the folly of the criminal." Robert Louis Stevenson was able, even in faraway Samoa, to recognise the strong similarity between Joseph Bell and Sherlock Holmes: "My compliments on your very ingenious and very interesting adventures of Sherlock Holmes. ... can this be my old friend Joe Bell?" Other authors sometimes suggest additional influences—for instance, the famous Edgar Allan Poe character C. Auguste Dupin. Dr. (John) Watson owes his surname, but not any other obvious characteristic, to a Portsmouth medical colleague of Doyle's, Dr James Watson. A sequel to A Study in Scarlet was commissioned, and The Sign of the Four appeared in Lippincott's Magazine in February 1890, under agreement with the Ward Lock company. Doyle felt grievously exploited by Ward Lock as an author new to the publishing world and he left them. Short stories featuring Sherlock Holmes were published in the Strand Magazine. Doyle wrote the first five Holmes short stories from his office at 2 Upper Wimpole Street (then known as Devonshire Place), which is now marked by a memorial plaque. In December 1893, to dedicate more of his time to his historical novels, Doyle had Holmes and Professor Moriarty plunge to their deaths together down the Reichenbach Falls in the story "The Final Problem". Public outcry, however, led him to feature Holmes in 1901 in the novel The Hound of the Baskervilles. Holmes' fictional connection with the Reichenbach Falls is celebrated in the nearby town of Meiringen. Between 1888 and 1906, Doyle wrote seven historical novels, which he and many critics regarded as his best work. He also authored nine other novels, and later in his career (1912–29) five narratives, two of novel length, featuring the irascible scientist Professor Challenger. The Challenger stories include what is probably his best-known work after the Holmes oeuvre, The Lost World. His historical novels include Sir Nigel and its follow-up The White Company, set in the Middle Ages. He was a prolific author of short stories, including two collections set in Napoleonic times featuring the French character Brigadier Gerard. Doyle's stage works include Waterloo, the reminiscences of an English veteran of the Napoleonic Wars, the character of Gregory Brewster being written for Henry Irving; The House of Temperley, the plot of which reflects his abiding interest in boxing; The Speckled Band, after the short story "The Adventure of the Speckled Band"; and the 1893 collaboration with J.M. Barrie on the libretto of Jane Annie. While living in Southsea, the seaside resort of Portsmouth, Doyle played football as a goalkeeper for Portsmouth Association Football Club, an amateur side, under the pseudonym A. C. Smith. Doyle was a keen cricketer, and between 1899 and 1907 he played 10 first-class matches for the Marylebone Cricket Club (MCC). He also played for the amateur cricket teams the Allahakbarries and the Authors XI alongside fellow writers J. M. Barrie, P. G. Wodehouse and A. A. Milne. His highest score, in 1902 against London County, was 43. He was an occasional bowler who took just one first-class wicket, although one of the highest pedigree as it was W. G. Grace. Doyle was an amateur boxer. In 1909, he was invited to referee the James Jeffries–Jack Johnson heavyweight championship fight in Reno, Nevada. Doyle wrote, "I was much inclined to accept...though my friends pictured me as winding up with a revolver at one ear and a razor at the other. However, the distance and my engagements presented a final bar." In 1885 Doyle married Louisa (sometimes called "Touie") Hawkins (10 April 1857 – 4 July 1906). She was the youngest daughter of J. Hawkins, of Minsterworth, Gloucestershire, and the sister of one of Doyle's patients. Louisa suffered from tuberculosis. In 1907 he married Jean Elizabeth Leckie (14 March 1874 – 27 June 1940), whom he had first met and fallen in love with in 1897. He had maintained a platonic relationship with Jean while his first wife was still alive, out of loyalty to her. Jean died in London. Doyle fathered five children. He had two with his first wife: Mary Louise (28 January 1889 – 12 June 1976) and Arthur Alleyne Kingsley, known as Kingsley (15 November 1892 – 28 October 1918). He had an additional three with his second wife: Denis Percy Stewart (17 March 1909 – 9 March 1955), second husband of Georgian Princess Nina Mdivani; Adrian Malcolm (19 November 1910 – 3 June 1970); and Jean Lena Annette (21 December 1912 – 18 November 1997). All of Doyle's five children died without issue, leaving him with no grandchildren or direct descendants. He stood for Parliament twice as a Liberal Unionist—in 1900 in Edinburgh Central and in 1906 in the Hawick Burghs—but although he received a respectable vote, he was not elected. Doyle was appointed a Knight of Grace of the Order of the Hospital of Saint John of Jerusalem in 1903. The second case, that of Oscar Slater, a Jew of German origin who operated a gambling-den, convicted of bludgeoning an 82-year-old woman in Glasgow in 1908, excited Doyle's curiosity because of inconsistencies in the prosecution case and a general sense that Slater was not guilty. He ended up paying most of the costs for Slater's successful appeal in 1928. Also in Southsea in 1887, influenced by a member of the Portsmouth Literary and Philosophical Society, Major-General Alfred Wilks Drayson, he began a series of psychic investigations. These included attending around 20 seances, experiments in telepathy and sittings with mediums. Writing to Spiritualist journal Light, that year, he declared himself to be a Spiritualist and spoke of one particular psychic event that had convinced him. Though he later wavered, he remained fascinated by the paranormal. He was a founding member of the Hampshire Society for Psychical Research in 1889 and joined the London-based Society for Psychical Research in 1893. He joined Sir Sidney Scott and Frank Podmore on a poltergeist investigation in Devon in 1894. Nevertheless, during this period, he remained, in essence, a dilettante. During 1916, at the height of World War I, a change came over Conan Doyle's beliefs prompted by the apparent psychic abilities of his children's nanny, Lily Loder Symonds. This, combined with the deaths he saw around him, made him rationalise that Spiritualism was a "New Revelation" sent by God to bring solace to the bereaved. The New Revelation was the title of his first Spiritualist work, published two years later. In the intervening years, he wrote to Light magazine about his faith and lectured frequently on the truth of Spiritualism. War-related deaths close to him certainly strengthened his long-held belief in life after death and spirit communication, though it is wrong to claim that the death of his son, Kingsley, turned him to Spiritualism, as is often stated. Doyle came out as a Spiritualist to the public in 1916, a full two years before his son's death. It was on 28 October 1918 that Kingsley died from pneumonia contracted during his convalescence after being seriously wounded in the 1916 Battle of the Somme. Doyle's brother Brigadier-general Innes Doyle died, also from pneumonia, in February 1919. His two brothers-in-law (one of whom was E. W. Hornung, creator of the literary character Raffles) and his two nephews also died shortly after the war. His second book on Spiritualism, The Vital Message, appeared in 1919. In 1919 the magician P. T. Selbit staged a séance at his own flat in Bloomsbury, with Doyle in attendance. Some later commentators have stated that he declared the clairvoyance manifestations to be genuine. However, the contemporary report by the Sunday Express quotes Doyle as saying: "I should have to see it again before passing a definite opinion on it," and: "I have my doubts about the whole thing". In 1920, Doyle debated the claims of Spiritualism with the notable sceptic Joseph McCabe at Queen's Hall in London. McCabe later published his evidence against the claims of Doyle and Spiritualism in a booklet entitled Is Spiritualism Based on Fraud? which claimed Doyle had been duped into believing Spiritualism by mediumship trickery. Doyle believed that many cases of diagnosed mental illness were the result of spirit possession. He debated the psychiatrist Harold Dearden, who was diametrically opposed to Doyle's views. He travelled to Australia and New Zealand on spiritualist missionary work in 1920, and continued his mission all the way up to his death, speaking about his spiritualist conviction in Britain, Europe, and the United States. Doyle was also inspired by his Spiritualist beliefs to write a novel on the subject, The Land of Mist, featuring the character Professor Challenger. 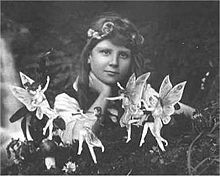 He wrote many other non-fictional Spiritualist works; perhaps his most famous being The Coming of the Fairies (1922) which reveals Conan Doyle's conviction in the veracity of the five Cottingley Fairies photographs. He reproduced them in the book, together with theories about the nature and existence of fairies and spirits. Initially suspected of being falsified, the photos were decades later determined to be faked (along with admissions from the photographers). Doyle and spiritualist William Thomas Stead were duped into believing Julius and Agnes Zancig had genuine psychic powers, both claiming that the Zancigs used telepathy. In 1924 Julius and Agnes Zancig confessed that their mind reading act was a trick and published the secret code and all the details of the trick method they had used, under the title Our Secrets!! in a London newspaper. Doyle praised the psychic phenomena and spirit materializations produced by Eusapia Palladino and Mina Crandon, who were both exposed as frauds. Doyle's two-volume book The History of Spiritualism was published in 1926. W. Leslie Curnow, a spiritualist, contributed much research to the book. In 1926, Robert John Tillyard wrote a predominantly supportive review of Doyle's book The History of Spiritualism in the journal Nature. This caused controversy, and several critics such as A. A. Campbell Swinton pointed to the evidence of fraud in mediumship and Doyle's non-scientific approach to the subject. In 1927, Doyle spoke in a filmed interview about Sherlock Holmes and spiritualism. Doyle commissioned a newly-built home from Joseph Henry Ball, an architect friend, in 1895, and played an active part of the design process. 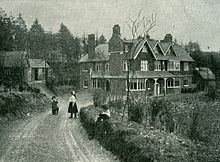 He lived in Undershaw which is near Hindhead in Surrey from October 1897 to September 1907. It was a hotel and restaurant from 1924 until 2004, when it was bought by a developer and stood empty while conservationists and Doyle fans fought to preserve it. In 2012, the High Court in London ruled the redevelopment permission be quashed because proper procedure had not been followed, but it is now due to become part of the Stepping Stones school for children with disabilities and additional needs. Doyle was staying at the Lyndhurst Grand Hotel during March 1912 and made his most ambitious foray into architecture: sketching the original designs for a third storey extension and altering the front facade to the building. Work began later that year and the building as it is today is a near perfect expression of Doyle's plans. In 1914, on a family trip to the Jasper National Park in Canada, he designed a golf course and ancillary buildings for a hotel. The plans were realised in full, but neither the golf course nor the buildings have survived. In 1926, Doyle laid the foundation stone for a Spiritualist temple in Camden, London. Of the building's total £600 construction costs, he provided £500. ^ Stashower says that the compound version of his surname originated from his great-uncle Michael Conan, a distinguished journalist, from whom Arthur and his elder sister, Annette, received the compound surname of "Conan Doyle" (Stashower 20–21). The same source points out that in 1885 he was describing himself on the brass nameplate outside his house, and on his doctoral thesis, as "A. Conan Doyle" (Stashower 70). ^ Redmond, Christopher (2009). Sherlock Holmes Handbook 2nd ed. Dundurn. p. 97. Google Books. Retrieved 11 February 2017. ^ Doyle, Steven; Crowder, David A. (2010). Sherlock Holmes for Dummies. Hoboken, New Jersey: John Wiley & Sons. p. 51. ^ a b "No. 27494". The London Gazette. 11 November 1902. p. 7165. ^ "Scottish Writer Best Known for His Creation of the Detective Sherlock Holmes". Encyclopædia Britannica. Retrieved 30 December 2009. ^ "Sir Arthur Conan Doyle Biography". sherlockholmesonline.org. Archived from the original on 2 February 2011. Retrieved 13 January 2011. ^ The details of the births of Arthur and his siblings are unclear. Some sources say there were nine children, some say ten. It seems three died in childhood. See Owen Dudley Edwards, "Doyle, Sir Arthur Ignatius Conan (1859–1930)", Oxford Dictionary of National Biography, Oxford University Press, 2004; Encyclopædia Britannica; Arthur Conan Doyle: A Life in Letters, Wordsworth Editions, 2007 p. viii; ISBN 978-1-84022-570-9. ^ a b c d e f g h i j k Owen Dudley Edwards, "Doyle, Sir Arthur Ignatius Conan (1859–1930)", Oxford Dictionary of National Biography, Oxford University Press, 2004. ^ Lellenberg, Jon; Stashower, Daniel; Foley, Charles (2007). Arthur Conan Doyle: A Life in Letters. HarperPress. pp. 8–9. ISBN 978-0-00-724759-2. ^ a b Pascal, Janet (2000). Arthur Conan Doyle: Beyond Baker Street. New York: Oxford University Press. p. 14. ISBN 0195122623. ^ a b O'Brien, James (2013). The Scientific Sherlock Holmes: Cracking the Case with Science and Forensics. New York: Oxford University Press. p. 1. ISBN 9780199794966. ^ Miller, Russell (2010). The Adventures of Arthur Conan Doyle. New York: Random House. ISBN 9781407093086. ^ Golgotha Press (2011). The Life and Times of Arthur Conan Doyle. BookCaps Study Guides. ISBN 978-1-62107-027-6. In time, he would reject the Catholic religion and become an agnostic. ^ Pascal, Janet B. (2000). Arthur Conan Doyle: Beyond Baker Street. Oxford University Press. p. 139. ^ Brown, Yoland (1988). Ruyton XI Towns, Unusual Name, Unusual History. Brewin Books. pp. 92–93. ISBN 0-947731-41-5. ^ McNeill, Colin (6 January 2016). "Mystery solved of how Sherlock Holmes knew so much about poisonous plants". Herald Scotland. Retrieved 9 January 2016. ^ Stashower, Daniel (2000). Teller of Tales: The Life of Arthur Conan Doyle. Penguin Books. pp. 30–31. ISBN 0-8050-5074-4. ^ Robert Mendick (23 May 2015). "Russian supergrass 'poisoned after being tricked into visiting Paris'". Sunday Telegraph. Retrieved 24 May 2015. ^ Conan Doyle, Arthur (Author), Lellenberg, Jon (Editor), Stashower, Daniel (Editor) (2012). Dangerous Work: Diary of an Arctic Adventure. University Of Chicago Press; ISBN 0-226-00905-X; ISBN 978-0-226-00905-6. ^ Capelotti, P.J. (2013). Shipwreck at Cape Flora: The Expeditions of Benjamin Leigh Smith, England's Forgotten Arctic Explorer. New York: University of Calgary. pp. 156–162. ISBN 978-1-55238-712-2. Retrieved 29 December 2018. ^ Available at the Edinburgh Research Archive. ^ Stashower, pp. 55, 58–59. ^ "Compulsory Vaccination - The Evening Mail - The Arthur Conan Doyle Encyclopedia". www.arthur-conan-doyle.com. ^ "Compulsory Vaccination - The Hampshire County Times - The Arthur Conan Doyle Encyclopedia". www.arthur-conan-doyle.com. ^ Higham, Charles (1976). The Adventures of Conan Doyle. New York: W.W. Norton. pp. 86–87. ^ Diniejko, Andrzej. "Sir Arthur Conan Doyle: A Biographical Introduction". The Victorian Web. Retrieved 21 October 2016. ^ Doyle, Arthur Conan, Memories and Adventures (Reprint), Cambridge University Press, (Cambridge) 2012, p.26. ^ Letter from R L Stevenson to Doyle 5 April 1893 The Letters of Robert Louis Stevenson Volume 2/Chapter XII. ^ Sova, Dawn B. Edgar Allan Poe: A to Z. New York: Checkmark Books, 2001. pp. 162–163. ISBN 0-8160-4161-X. ^ a b c d Carr, John Dickson (1947). The Life of Sir Arthur Conan Doyle. ^ City of Westminster green plaques Archived 16 July 2012 at the Wayback Machine; accessed 22 March 2014. ^ Panek, LeRoy Lad (1987). An Introduction to the Detective Story. Bowling Green, OH: Bowling Green State University Popular Press. p. 78. ISBN 0-87972-377-7. Retrieved 4 January 2012. ^ Saunders, Emma (6 June 2011). "First Conan Doyle novel to be published". BBC. Archived from the original on 7 June 2011. Retrieved 6 June 2011. ^ "Mary Celeste – definition of Mary Celeste in English from the Oxford dictionary". ^ Juson, Dave; Bull, David (2001). Full-Time at The Dell. Hagiology Publishing. p. 21. ISBN 0-9534474-2-1. ^ "Arthur Conan Doyle". ESPN Cricinfo. Retrieved 17 January 2018. ^ Parkinson, Justin (26 July 2014). "Authors and actors revive cricket rivalry". BBC News Magazine. Retrieved 10 April 2019. ^ "London County v Marylebone Cricket Club at Crystal Palace Park, 23–25 Aug 1900". Static.cricinfo.com. Retrieved 2 March 2010. ^ a b Rawson, Mitchell (13 March 1961). "A Case for Sherlock". Sports Illustrated Vault. Retrieved 23 July 2018. ^ Arthur Conan Doyle. "Memories and Adventures", p. 222. Oxford University Press, 2012; ISBN 1441719288. ^ a b Leeman, Sue, "Sherlock Holmes fans hope to save Doyle's house from developers", Associated Press, 28 July 2006. ^ Janet B. Pascal (2000). "Arthur Conan Doyle:Beyond Baker Street: Beyond Baker Street". p. 95. Oxford University Press; ISBN 0195122623. ^ "No. 35171". The London Gazette. 23 May 1941. p. 2977. ^ Itzkoff, Dave (18 January 2010). "Heirs to Sherlock Holmes Face Web of Ownership Issues". The New York Times. ISSN 0362-4331. Retrieved 18 July 2017. ^ "Who owns Sherlock Holmes?". The Telegraph. Retrieved 18 July 2017. ^ Miller, Russell. The Adventures of Arthur Conan Doyle. New York: Thomas Dunne Books, 2008. pp. 211–217; ISBN 0-312-37897-1. ^ "No. 27453". The London Gazette. 11 July 1902. p. 4444. ^ "No. 27550". The London Gazette. 8 May 1903. p. 2921. ^ Spiring, Paul. "B. Fletcher Robinson & 'The Lost World'". Bfronline.biz. Archived from the original on 3 October 2011. Retrieved 2 October 2011. ^ Wijesinha, Rajiva (2013). "Twentieth Century Classics: Reflections on Writers and Their Times". Cambridge University Press. ^ Roughead, William (1941). "Oscar Slater". In Hodge, Harry (ed.). Famous Trials. 1. Penguin Books. p. 108. ^ Beresiner, Yasha (2007). "Arthur Conan Doyle, Spiritualist and Freemason". Masonic papers. PIETRE-STONES REVIEW OF FREEMASONRY. Retrieved 13 March 2015. ^ Wingett, Matt (2016). Conan Doyle and the Mysterious World of Light, 1887–1920. Life Is Amazing. pp. 19–32. ISBN 978-0-9-5724135-0. ^ a b Wingett, Matt (2016). Conan Doyle and the Mysterious World of Light, 1887–1920. Life Is Amazing. pp. 32–36. ISBN 978-0-9-5724135-0. ^ Wingett, Matt (2016). Conan Doyle and the Mysterious World of Light, 1887–1920. Life Is Amazing. pp. 43–44. ISBN 978-0-9-5724135-0. ^ a b Wingett, Matt (2016). Conan Doyle and the Mysterious World of Light, 1887–1920. Life Is Amazing. pp. 44–48. ISBN 978-0-9-5724135-0. ^ Price, Leslie (2010). "Did Conan Doyle Go Too Far?". Psychic News (4037). ^ Ian Topham (31 October 2010). "The Ghost Club – A History by Peter Underwood". Mysteriousbritain.co.uk. Archived from the original on 3 July 2013. Retrieved 28 May 2013. ^ Wingett, Matt (2016). Conan Doyle and the Mysterious World of Light, 1887–1920. Life Is Amazing. pp. 160–161. ISBN 978-0-9-5724135-0. ^ Joseph McCabe. (1920). Is Spiritualism Based On Fraud? The Evidence Given By Sir A. C. Doyle and Others Drastically Examined. London Watts & Co.
^ "The Coming of the Fairies". British Library catalogue. British Library. Retrieved 12 June 2013. ^ Polidoro, Massimo. "Houdini's Impossible Demonstration". Skeptical Inquirer. The Committee for Skeptical Inquiry. Archived from the original on 12 April 2017. Retrieved 19 November 2017. ^ Polidoro, Massimo. "Houdini's Impossible Demonstration". Skeptical Inquirer. The Committee For Skeptical Inquiry. http://www.csicop.org/SI/show/houdinirsquos_impossible_demonstration/ (August 2006). ^ Massimo Polidoro (2011). "Photos of Ghosts: The Burden of Believing the Unbelievable by Massimo Polidoro". Csicop.org. Retrieved 5 December 2013. ^ Stashower, Daniel (1999). Teller of Tales: The Life of Arthur Conan Doyle. Henry Holt & Company. "A Spiritualist researcher named Leslie Curnow contributed a great deal of material and wrote some of the chapters, which Conan Doyle freely admits in the book's preface." ^ Tillyard, Robert John (1926). "The History of Spiritualism". Nature. 118: 147–149. doi:10.1038/118147a0. ^ Swinton, A. A. Campbell (1926). "Science and Psychical Research" (PDF). Nature. 118: 299–300. doi:10.1038/118299a0. ^ Donkin, Bryan (1926). "Science and Psychical Research" (PDF). Nature. 118: 480. doi:10.1038/118480a0. ^ Donkin, Bryan (1926). "Science and Psychical Research" (PDF). Nature. 118: 658–659. doi:10.1038/118658a0. ^ Arthur Conan Doyle Interviewed on Sherlock Holmes and Spirituality. 16 April 2009 – via YouTube. ^ ""Piltdown Man: Britain's Greatest Hoax" 17 February 2011 BBC". Retrieved 5 October 2014. ^ ""Piltdown Man: British archaeology's greatest hoax" The Guardian 5 February 2012". the Guardian. Retrieved 5 October 2014. ^ Historic England, 1977 (amended 2014), Reasons for Designation – Architectural Interest, "Undershaw List Entry," 1244471, National Heritage List for England (NHLE). ^ Duncan, Alistair (2011). An Entirely New Country: Arthur Conan Doyle, Undershaw and the Resurrection of Sherlock Holmes. MX Publishing. ISBN 978-1-908218-19-3. ^ "Sir Arthur Conan Doyle house development appeal upheld". BBC News. 12 November 2012. Retrieved 12 November 2012. ^ Crossley, Frankie. "Blur guitarist leads fight to save Camden Road Spiritualist Temple". Hampstead Highgate Express. ^ Limited, Alamy. "Stock Photo – Wooden headstone of Sir Arthur Conan-Doyle at a special display in the Town's museum. Portsmouth, Hampshire, UK". Alamy. Retrieved 15 March 2016. ^ "City Museums". www.portsmouthcitymuseums.co.uk. Retrieved 15 March 2016. ^ Johnson, Roy (1992). "Studying Fiction: A Guide and Study Programme", p. 15. Manchester University Press; ISBN 0719033977. ^ "Arthur Conan Doyle (1859–1930), author database), librarything.com; retrieved 17 March 2012". Retrieved 5 October 2014. ^ "Sherlock Holmes statue reinstated in Edinburgh after tram works", bbc.co.uk; retrieved 6 November 2012. Margalit Fox (2018). Conan Doyle for the Defense. Random House. Arthur Conan Doyle Collection at Toronto Public Library. "Archival material relating to Arthur Conan Doyle". UK National Archives.